Seavey's have won the Iditarod: Son and Father come in #1 & #2 for the first time in history. 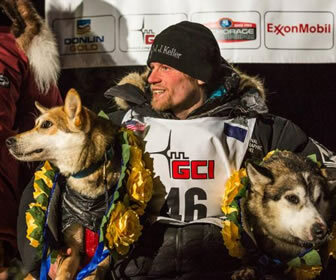 Now you can meet the actual winners of the 2015 Iditarod in person. Father Mitch Seavey is a finished the 2015 Iditarod in second place behind his son Dallas after winning the race in 2004 and 2013. Dallas Seavey: Dallas Seavey has just won his third Iditarod in four years. Dallas won the race in 2012, 2014 and 2015. Seavey's Amazing Sleddog Tours and Rides, Voted the best sled dog rides in Alaska and they're available right here in Seward Alaska along the road to Exit Glacier. Tops the list of "The best thing to do in Seward Alaska"
Meet the real Iditarod racers and listen to the stories from their times on the trails. Call 1-907-224-8607 to check availability and rates.